It’s a result of the political shenanigans that roiled the City in 1986 and led to a series of charter changes to reform the way New York City government conducts business, including how vacancies in elected offices are filled. A review of the ballot for Tuesday’s election shows a Fix the MTA party along with the No More Delays group, both referencing the City’s transit system, maybe with the hope of harnessing riders’ dissatisfaction. Party names such as Unite Immigrants and Equality for All skew toward the progressive side. Two reference forward motion—Power Forward and It’s Time Let’s Go. There are the inevitable community-based references: Community Strong, Residents First and For the People. And that’s only about half of the party names. This nonpartisan election will be the first to replace a Citywide elected official since voters approved a ballot measure in 1988 to require candidates to run without using traditional party names such as Democrat, Republican, Conservative or Working Families. And therein lies the tale. 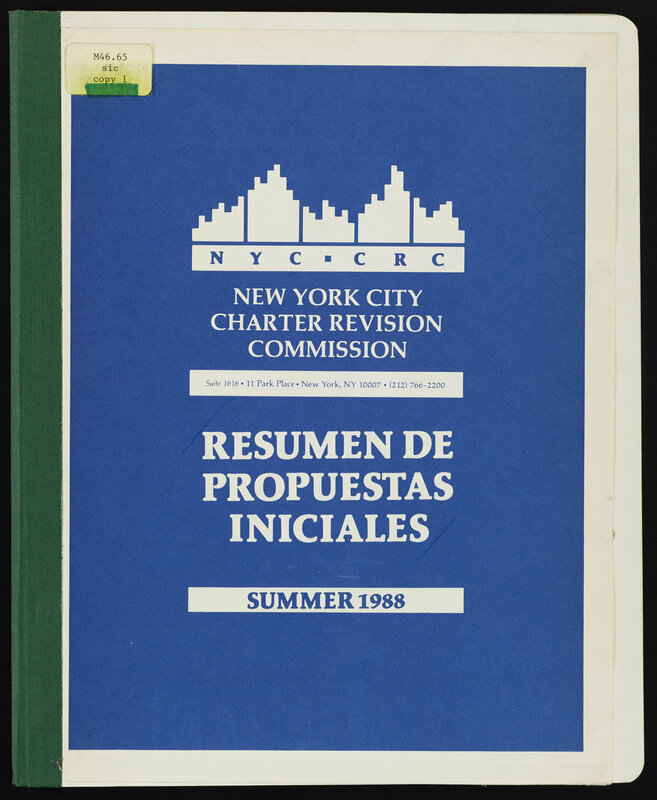 New York City Charter Revision Commission Report, 1988. NYC Municipal Library. In that same year, a federal district judge ruled that City government’s decision-making body, the Board of Estimate, violated the one person one vote Constitutional guarantee. 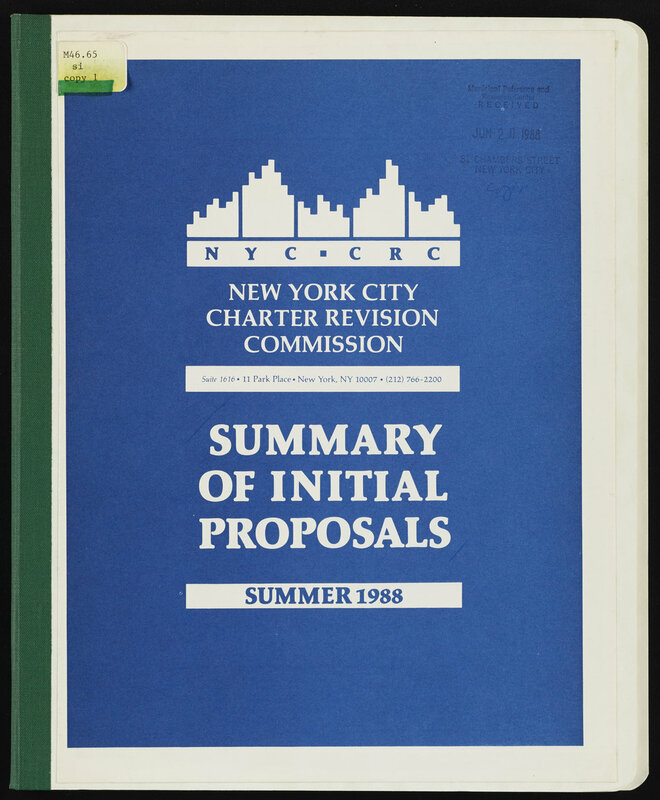 To research possible remedies, Mayor Ed Koch appointed a charter revision commission, chaired by Richard Ravitch, former head of the Metropolitan Transportation Authority and future candidate for Mayor. The Commission was composed of a who’s who of government leaders including former Mayor Robert Wagner, Urban League CEO Harriet Michel, Fordham University President Joseph O’Hare S.J. among others. In February, 1988, the U. S. Supreme Court agreed to hear arguments on the matter and the Ravitch Commission decided that it was not feasible to propose a new governmental structure before the Court ruled. Instead they would focus on charter issues that would not impact the powers of elected officials. By that time, the Commission staff had completed 18 months of research on topics such as establishing a system for when a Mayor is not capable of or unable to fulfill the duties of office, strengthening the campaign finance program, maintaining the City’s infrastructure, creating a strong ethics code and how vacancies in public offices would be filled. A report by SUNY New Paltz Professor Gerry Benjamin quantified the number of borough presidents who were appointed to the office to fill vacancies between 1960 and 1988. A staggering 17 out of 26 individuals, including the successors to Manes and Simon, were initially appointed not elected. Of the five sitting borough presidents, only Guy Molinari of Staten Island had been directly elected by the voters. Vacant positions were filled by a vote of the council delegation from the particular borough. Similarly, if a council member left office during a term, the vacancy was filled by a vote of all remaining members of the Council. The recent replacements of B.P. Manes with his deputy Claire Shulman and Bronx B.P. Simon by Council member Freddy Ferrer received considerable news coverage, much of it unfavorable. The bad press wasn’t a commentary on the merits of Ferrer or Shulman. Instead, it reflected dissatisfaction with the political party chairs pulling strings and hand picking the replacements, mocking any notion of electoral democracy. This convergence of government scandal and government reorganization is reflected in the deliberations of the charter commission and in the six ballot questions that they submitted to the voters in November, 1988. That February, the commission members still thought they would be remaking all of City government. Nevertheless, they also focused on approaches to ensure fair and open elections. Archibald Murray, then the head of the Legal Aid Society, stated the case for change at a February 25, 1988 meeting. “…you started off with the notion that we are working in a democracy, and that, I think, is the critical factor. It seems to me that the whole idea of a legislative body is to get a group of people together who have been selected by the people to represent the people. As the debate continued, various commissioners, including Amy Betanzos and Frank Macchiarola expressed support for filling the vacant posts by the electorate, leading former deputy mayor Nat Leventhal to comment on the disproportionate impact that the appointments had. The Charter Review, 1988 Election Special, Vol 2, No. 2. NYC Municipal Library. Later, the Commission determined that a ballot line would need a name beyond that of the individual running. In succeeding months, the discussion evolved to a more arcane debate about the timing of the nonpartisan election and its relationship to the schedule of primary and general elections established by State law. The final dense charter language includes several schedules for the replacement election depending on the point in the term when the vacancy occurs and how quickly the election must be called. More than a million people voted for the charter reforms in 1988. All passed. Nonpartisan elections received support from 87.2% per cent of those voting. Thus we have 17 unique party names on the Public Advocate ballot. And now, thirty-one years later, when the grip of party leaders has weakened and the most recent City elections produced several upset victors, City voters will directly choose the next Public Advocate. Whoever wins will serve for ten months, until midnight on December 31, 2019. And that person or his/her successor will be chosen in this year’s scheduled primary and general elections to serve through December 2021. *For more on this tumultuous period, read City for Sale by Jack Newfield and Wayne Barrett.